The aetosaur Desmatosuchus. Photo © Robert Gay. Aetosaurs are reptiles of the Late Triassic. Their name means "eagle lizard", and comes from the fact that their skulls somewhat resemble that of a bird. Though the head resembled a bird, it ended in a pig-like snout over a shovel-shaped jaw. The body was long and narrow like a crocodile's, though some had a broad turtle-like midsection, and they were covered in armor like an armadillo. In other words, the aetosaurs were heavily armored animals with the body of a crocodile, snout of a pig, and skull of a bird. What a mixture! Aetosaurs have only been found in sediments of the Late Triassic, when all the land of the world was joined together in the supercontinent Pangea. This vast continent had immense implications for the weather where aetosaurs lived. The huge continent caused large monsoonal weather patterns. Most likely, the areas where aetosaurs lived were quite wet, with long rainy seasons and meandering streams. This can be deduced from the shales in which aetosaurs are found because shales are formed when mud is compacted under great pressure for long periods of time. Aetosaurs thus lived in wet environments like modern alligators, and wherever fossils of aetosaurs are found, it is possible to deduce the paleoenvironment of that locality. Fossils of aetosaurs have been found in Europe and in North and South America, though they may have had a worldwide distribution. The most famous aetosaur localities are Elgin, Scotland, where Aetosaurus and Stagonolepis were found, and the Chinle Formation of western North America where we find Desmatosuchus. The most common aetosaur fossil are of the bony scutes, or plates which make up the body armor. 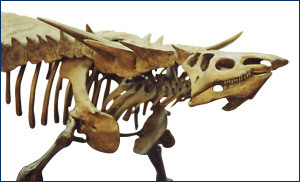 Argentine aetosaur: It is rare to find a museum with a reconstructed mounting of an aetosaur. The one pictured above is Neoaetosauroides engaeus from the Upper Triassic of San Juan Province in Argentina, and is on display at the Tucumán Museum in that country. Notice the extensive body armor that protected this animal, and the positioning of the legs very close to the body. Neoaetosauroides engaeus photos by John Hutchinson. Aetosaurs were sizeable reptiles that grew to be one to five meters long, the average being about three meters (10 feet). Most aetosaurs possessed a rather narrow crocodile-like body, although some had a broad turtle-like midsection. The animal was protected throughout by an armor covering over the neck and the upper and under surfaces of the trunk and tail. Some species, such as Desmatosuchus, also had heavy spikes along the shoulders and flanks. Based on their fossils and the fact that they were herbivores, aetosaurs probably relied on their armor and large size rather than speed to protect them from predators. Aetosaurs not only resembled crocodiles superficially, but were close relatives. Both aetosaurs and crocodiles belong to the Pseudosuchia, a group that also includes the phytosaurs. The Pseudosuchia in turn belongs to the larger group Archosauria that includes the dinosaurs. Like their dinosaur relatives, aetosaurs' legs were positioned directly beneath the hip joint, a feature that makes walking on land more efficient. However, the short, robust limbs suggest it may have moved much like the modern crocodile. You can see a closeup view of an aetosaur hip in the picture at right. Also like dinosaurs, and crocodilians, aetosaurs probably built nests and protected their eggs. In 1996, geologist Stephen Hasiotis discovered 220 million-year-old, fossilized, bowl-like nests in Arizona's Petrified Forest, in part of the Chinle Formation. This is a time when some reptiles stopped laying their eggs directly on the soil and started protecting them, and the oldest such nests that have been found there belonged to the phytosaurs and the aetosaurs. The nests are compacted and appear to be very similar to the nests of the modern day crocodiles who guard their nests. They were holes originally dug out of the sand along the bend of an ancient river. The aetosaurs were primarily herbivorous animals, and were the first group of archosaurs to begin eating plants. Most likely, they fed on leaves and foliage from various ferns and "seed ferns" that were prevalent in their habitat. They had disproportionately small heads with small spoon or leaf-shaped teeth, though oddly all their teeth are found in the upper jaw. Aetosaurs had a pig-like snout with a toothless tip shaped into a small shovel-like ridge, perhaps useful for digging up roots, rhizomes, and tubers. 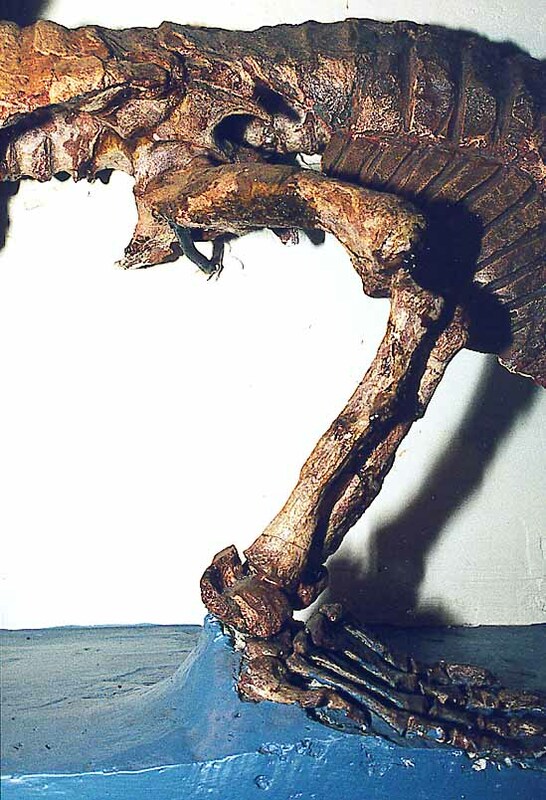 This might have compensated for the fact that the front feet of aetosaurs were small and clawless. Some aetosaurs had wide, turtle-shaped midsections that probably accommodated a large fermenting gut, a characteristic found in some later herbivorous dinosaurs. Although it is generally accepted that aetosaurs were herbivorous creatures, one recently discovered specimen from Texas (Saurosuchus) may have been carnivorous or omnivorous. This specimen has backward pointing sharp teeth that are thought to have been used to hold and rip flesh.